I'm so excited - I finished the Brown Bear quilt top this evening! Of course, I didn't want to wait until there's better lighting tomorrow to post a picture so this one will have to do. There were a few "firsts" with this quilt. I've never made a quilt that had cornerstones and at first I wasn't sure of the best way to piece them in order to get all of the seams to line up, but I figured it out. This was also the first time that I purchased fabric online specifically for a project. I knew exactly what I was getting with the Brown Bear panel but the green and blue fabrics were purchases solely off of images online. The green fabric was exactly what I wanted and matched perfectly. The blue fabric, however, was another matter. The colors matched but I couldn't tell from the online images that it had a metallic sheen to it. It was my own mistake, it clearly stated that it was a metallic in the description so I wasn't quite sure what to do. I needed to get this completed soon so I just decided to use it and hope for the best. I think it turned out okay but I think it made me a bit wary to purchase fabric online in the future. I had gone to my local quilt shop in the hopes of finding the striped border fabric but they only carried a few of the Hungry Caterpillar fabrics. I did find some fabric that I wanted to use for the backing - it's a blue blender from Timeless Treasures. If I'd found that before I'd started, I would have used it in place of the metallic blue. Oh well, no use fretting over it now because I have bigger things to worry about like how I should quilt this. That's always the hardest part for me right now. I've never done a quilt with an all-over quilting design and I don't think this is the quilt to try it on. If I just did a meander over the entire thing I could be done in a few days but I don't want to quilt over the white of blocks. I know I want to outline them so that leaves the question of what to do with all the borders and the cornerstones. I hope inspiration strikes soon! That border is perfect. It ties it all together. If you use a batting like warm and white, it only has to be quilted 8-10 inches apart. On quilts like this, I have just stitched in the ditch to let the fabric do the work. It's great!! The blue looks pretty darn perfect in the pictures though I'm a bit leary of buying online too. I have had a very positive experience with fabric.com taking back the fabric simply because I didn't like it at no expense to me. It looks great! As for quilting, how about quilting all around the outside, and then around each green and yellow square? So basically straight line quilting you could do with your walking foot. I did a couple of my first quilts like that, and they turned out well. Oh how pretty! I like the blue but then again, blues hog a big chunk of real estate in my stash too. :-) For the quilting, it would be cool to outline the animals with FMQ, in the stitch around the blocks & the cornerstones, and then piano keys (like every one or other one) of the thick stripes of the outside border. You can do that with a free motion foot so you don't have to keep going up & down. I can't tell how wide the stripes are but I think piano keys look great with most quilts. Well done! I think it's great. The blue metallic was a happy accident and makes it special! Have fun quilting! Great colours! I would stitch in the ditch around all the blocks and outline FM around the animals if it were my quilt. Perfect! We just read this book yesterday. Hello Diana, I am glad to meet you. 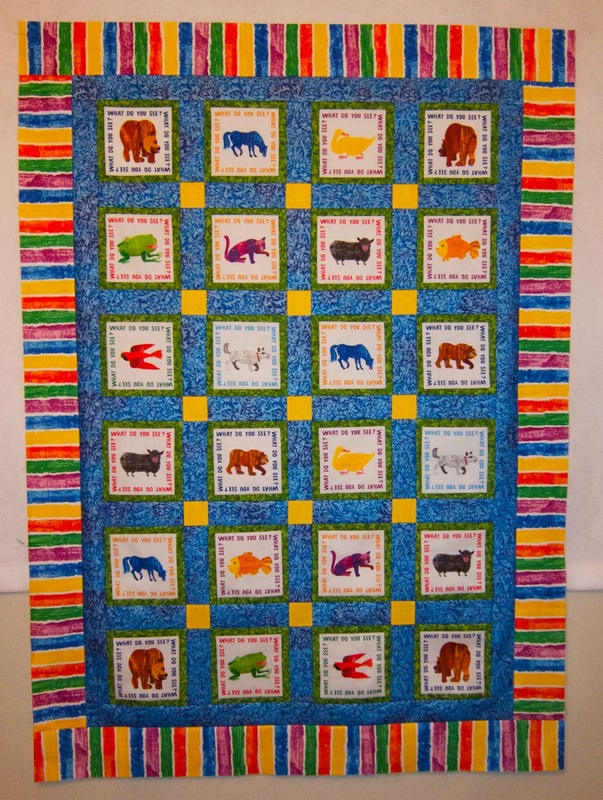 Your quilt is so cute, I love the bright colors and all the animals. 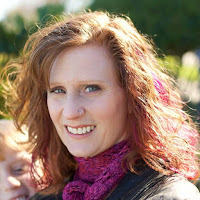 I am your newest follower and quilting blogging sister. Please stop by and visit.